The Multimission Archive at STScI (MAST) Newsletter disseminates information to users of the HST, GALEX, Kepler, FUSE, IUE, Copernicus, EUVE, HUT, UIT, WUPPE, HPOL, IMAPS, BEFS, TUES, VLA-FIRST, and XMM-OM data archives supported by MAST. Inquiries should be sent to archive@stsci.edu. We invite you to visit the STScI booth at the Washington DC AAS meeting in January. Staff members will be there to demonstrate several of the MAST interfaces including Kepler, StarView on the Web, the Hubble Legacy Archive (HLA) and GalexView. In order to get feedback from our users, MAST conducted a User Survey in May-June of 2009. We thank everyone who answered the survey. The results of the survey can be viewed at http://archive.stsci.edu/surveyresults/2009/index.html, and MAST responses to some of the comments and questions that we received are at http://archive.stsci.edu/surveyresults/2009/response2009.html. We also held our annual MAST Users Group (MUG) meeting, on July 9, 2009. The current MUG members are Steve Howell (Chair), Mike Crenshaw, Duilia de Mello, Casey Papovich, Evgenya Shkolnik, and Ben Williams. We thank all of the MUG members for their service and their helpful insights and suggestions. The presentations from the MUG meeting and the MUG report are available at http://archive.stsci.edu/mug/index.html. Kepler, a NASA Strategic mission, was launched into an Earth-trailing heliocentric orbit on March 6, 2009, and will stare at a 105 square degree region of the sky in the constellations of Cygnus and Lyra. The goal of the mission is to obtain precise long-term light curves of up to 100,000 cool stars and to search for periodic transits of planets as small as the Earth. A secondary objective is to study rapid oscillations of the target stars in order to determine their ages, radii, and chemical compositions. A general overview of the mission and more details about the scientific objectives can be found at the Kepler Mission website (http://kepler.nasa.gov/). The post-commissioning phase of the mission began on May 12, 2009. Since then, Kepler has monitored the same field in the sky almost continuously and will continue to do so for most of its nominal lifetime of three and a half years. MAST is very pleased to be hosting the data from the Kepler mission, and to announce that the MAST Kepler website (http://archive.stsci.edu/kepler/) is now public. Users may query the 6 million row Kepler Target Search Form in order to select potential targets known to be on the CCD detector, or the Kepler Input Catalog to search through 13 million objects in or near the Kepler field of view. During its commissioning phase, Kepler monitored over 50,000 stars brighter than V = 13.8 magnitudes as calibration targets. As the mission proceeds, the Project will periodically "deselect" stars as exoplanetary monitoring candidates. As it does so, MAST will provide access to lists of targets and/or data. These data will be announced on the MAST Kepler webpage as they become available. In addition, data for these stars will become available for download through the MAST Kepler Data Search and Retrieval page. MAST is pleased to announce the availability of "Quarter 0" (Q0) and "Quarter 1" (Q1) light curves. The data search page is located under Mission_Search on the main MAST web page (select Kepler Data), or directly at http://archive.stsci.edu/kepler/kepler_fov/search.php . Over 8000 of the ingested light curves are public, and available for browsing and download. All light curves are browse quality data, that is, they are not ready for publication. Extensive release notes are located under Documentation in the left gutter on the MAST/Kepler home page. Kepler data come in quarters (Q), with each quarter numbered sequentially. The Q0 data are from the end of commissioning, cover a 10 day time period and were obtained to confirm performance metrics. The Q1, or first quarter, data cover ~30 days from mid-May, 2009 to mid-June, 2009. Observations for GO Cycle 1 started in "Quarter 2" (Q2). MAST does not expect to receive Q2 light curves before mid December 2009. The Kepler Project requests that users who are not part of the Kepler Science Team refrain from submitting any results based on the light curves for publication until after January 15, 2010. The simplest way to find public data is by qualifying the Release Date element on the Data Search and Retrieval page, http://archive.stsci.edu/kepler/data_search/search.php. A reasonable value to enter is "<Jan 1 2010" (no comma and no quotes). Users may wish to qualify their searches by qualifying other elements on the page, e.g. by Teff, color, and/or magnitude. The search will return results on the Kepler Data Search Results page. Both above and below the table of results are a set of buttons. One is "Plot Marked Spectra." To browse a light curve, select it by clicking "Mark, then click the "plot Marked Spectra" button. 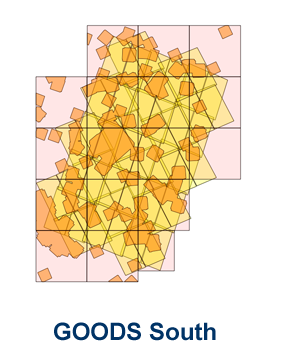 The plot can be manipulated by changing the values of the range, dimension and scale. Figure 1 shows an example of a Q0 lightcurve for a public target in the Kepler Project field of view. Figure 1: A Q0 light curve for an (essentially) randomly selected public target in the Kepler Project field of view. The time axis is in seconds, from the start of the exposure, and runs for almost 10 days. Fluxes are given as "electrons per cadence." Each major tick mark is 105 out of about 108 (hundred million) electrons. Extragalactic researchers should be aware that few if any extended objects in the 105 square degree Kepler field of view are available in the Kepler Input Catalog; the target page contains stars only. Users should go to the Kepler GO site at http://keplergo.arc.nasa.gov for details about submitting a proposal for Cycle 2. 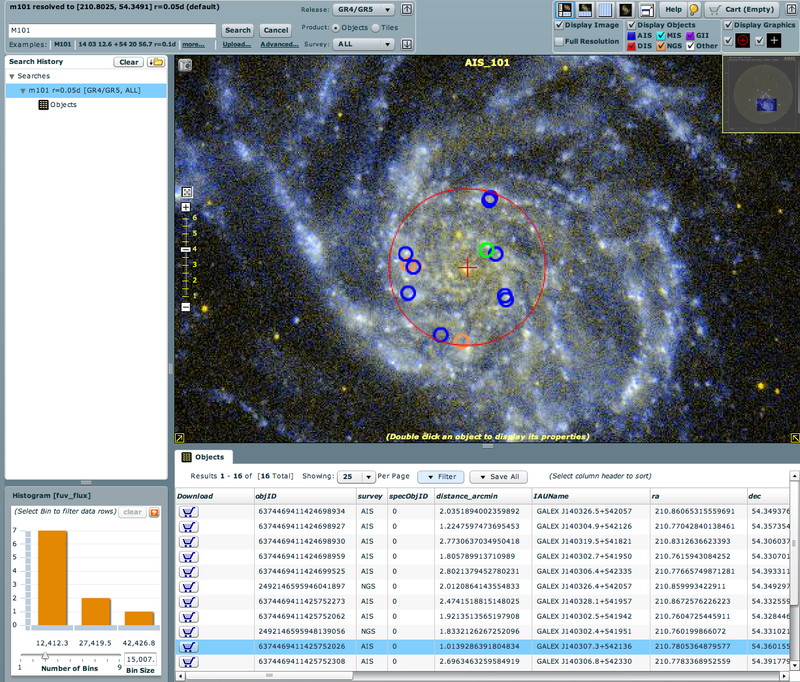 Some of our users may remember StarView, a Java based astronomical database browser and research analysis tool that was once the sole interface to the HST archive. The Java-based version of StarView has now been retired, but because StarView had a number of useful capabilities that the web interface does not offer, we have created a web-based version of StarView. StarView (On the Web) 1.0 is now available at: http://starview.stsci.edu/web. StarView (On the Web) uses "screens" (forms containing a set of query parameters) to search for HST and FUSE data. StarView loads a collection of pre-created "public" screens (coded by a pink color -- "pink is public") that are read-only and accessible to all users. They can be submitted without prior login, and provide Instrument Teams with a common set of screens to perform routine shared queries. You can browse all Public Screens grouped by instrument. Private Screens (colored yellow "yellow is yours") are customizable screens that are only available to the current logged in user. It is easy to customize a screen by dragging and dropping fields from the field list on to the Screen Form. You can reorder, delete, change field visibility or modify field qualifications within the editor. To access and save private screens, you must log in using your existing MAST Account. Modified private screens can be saved to the Screen Database, or exported to a JSON/text formatted file that can be emailed and shared with colleagues. All Right Ascension fields on a Screen Form contain a built in Name Resolver Tool that allows for quick coordinate resolution directly into the RA/DEC field qualifications. The Preview SQL Tool displays generated SQL based on current screen field composition and qualifications. Once you have identified data that you would like to download, selected records that contain a DataSetID column can be added to a Download Cart. The activated Download Cart then forwards the user directly to the MAST DataSet Retrieval Page with the DataSet(s) pre-loaded and ready to download. Please send any questions, comments, and suggestions about StarView on the Web to the archive help desk archive@stsci.edu. A link to StarView on the Web may be found on the "Tools" pulldown menu on the MAST website. 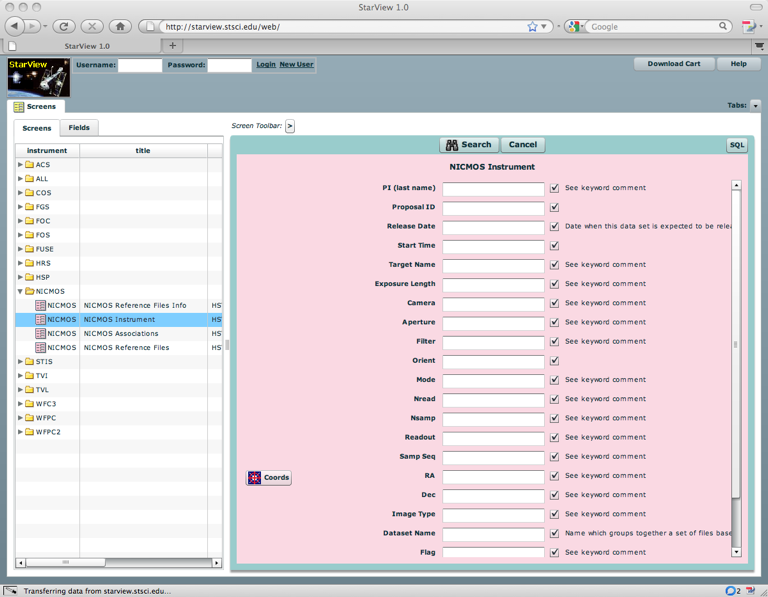 Figure 2: Screenshot of StarView on the Web showing the public "NICMOS Instrument" form. The Hubble Legacy Archive (HLA) plans to make Data Release 4 (DR4) available next January. Planned content for DR4 includes the first data from the newly installed WFC3 and COS, a nearly complete release of processed, coadded NICMOS data, and reprocessed WFPC2 data and source lists that take advantage of the latest improvements to the calibration pipeline. DR4 is also expected to include dozens of ACS mosaics and several improvements to the interface. A preview of the new content and interface improvements will be available in the MAST booth at the AAS meeting in Washington, DC. High-Level Science Products (HLSP) are community contributed, fully processed (reduced, co-added, cosmic-ray cleaned etc.) images and spectra that are ready for scientific analysis. MAST is pleased to announce the availability of several new HLSP, which can be accessed through the HLSP page (http://archive.stsci.edu/hlsp/index.html). Using the Advanced Camera for Surveys on HST, T. Brown (STScI) and collaborators obtained deep optical images reaching well below the oldest main sequence turnoff in six fields of the Andromeda Galaxy. The fields fall at four positions on the southeast minor axis, one position in the giant stellar stream, and one position on the northeast major axis. The goal of the project was to probe the star formation history in these various different parts of the Andromeda Galaxy. More information and data links are at http://archive.stsci.edu/prepds/andromeda/. The Orion Nebula hosts the richest cluster of young Pre-Main-Sequence stars within 1 kpc from the Sun and therefore represents an ideal laboratory to understand the process of star formation. The Hubble Space Telescope, with its exquisite sensitivity and spatial resolution, is providing unique data on this region. In particular, the HST Treasury Program on the Orion Nebula cluster (GO-10246, PI M. Robberto) has obtained deep multi-color photometry of thousands of sources well into the brown-dwarf regime, complemented by a rich set of ancillary data from ground-based observatories. Currently, data are available from two ground-based observatories: the ISPI camera at the CTIO observatory (Robberto et al, AJ in press) and the WFI camera at the ESO/MPIA 2.2m telescope (Da Rio et al. ApJS 183, 261, 2009). 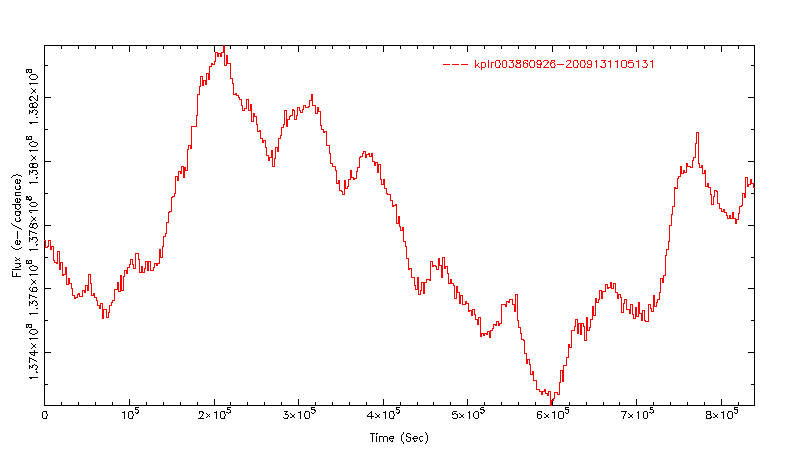 The HST data from GO-10246 will be released in 2010. More information and data links are at http://archive.stsci.edu/prepds/orion/. As a part of the HST Archival Research proposal 10937, Probing the Galaxy Population at z~7-10 Using Archival ACS & NICMOS data, PI Rychard Bouwens and colleagues retrieved and processed nearly all NICMOS camera 3 F110W and F160W data taken over the GOODS North and South fields. The data are organized into sets of images by passband (NICMOS F110W & F160W) and by the tiled GOODS "sections". Each GOODS NICMOS section is 2,730 x 2,730 pixels in size and a scale of 0.09 arcsec/pixel. There are 17 sections in the GOODS NICMOS North field and 18 sections the GOODS NICMOS South field. For each section, a drizzled science image, a weight image and a DS9 region file are provided. More information and data links are at http://archdev.stsci.edu/prepds/goodsnic/. MAST is hosting the data for StarCAT: HST STIS Echelle Spectral Catalog of Stars created by Thomas Ayres of the University of Colorado. Please visit his website at http://cos.colorado.edu/~ayres/StarCAT/. Final reprocessing of the WFPC2 and NICMOS data is now complete, with 99.99% of the data reprocessed and statically archived. These data are no longer calibrated through OTFR when requested. There are 186,460 WFPC2 datasets and 114,443 NICMOS products and singletons in the static archive. WFPC2 AREA mode data will need to be reprocessed again at a later date. Any new NICMOS data taken after 2008 will use the OTFR system for now. Users may request WFPC2 data in either standard multi-extension FITS (MEF) and/or wFITS format; the default is MEF. Questions? Send mail to archive@stsci.edu. The Galaxy Evolution Explorer (GALEX) is a NASA mission that uses microchannel plate detectors to obtain direct images in the near-UV (NUV) and far-UV (FUV) and a grism to disperse light for spectroscopy. Since its launch in 2003, GALEX has carried out a series of surveys in the imaging and spectroscopic mode, as well as conducting a Guest Investigator program. The GALEX project has released discrete sets of public data known as Galex Releases (GR), with the latest being GR5. GR5 was substantially augmented in January, 2009. We expect GR6 data to become available at MAST in early 2010 (February or March). In addition to its standard search forms, MAST has developed a powerful interface to search and browse GALEX data, called GalexView (http://galex.stsci.edu/galexview/). GalexView was recently updated with GalexView 1.4. Users can enter a target name or coordinates and radius, and the graphical interface displays a background image and location of sources in the various GALEX surveys. The source properties are listed in a table below the image. New features include a histogram function, which displays a graphical histogram of a selected column (such as source magnitude). Figure 3: Screenshot from the GalexView Interface to GALEX data at MAST. 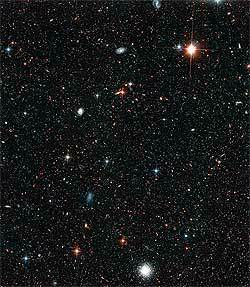 For nearly two decades, the Hubble Space Telescope has provided astronomers with scientific data from new observations. New knowledge based on the analysis of these observations is communicated in many ways among astronomers and to the public. The ultimate, official record of research and discovery is the publication of results in peer-reviewed journals. A team of library and archive staff members identify and track Hubble-based papers in peer-reviewed journals. A new database was created, based on the library's "StepSheet" database and the archive database of journal articles, and augmented by a re-examination of older papers. The database contains only papers that analyze Hubble data, and does not contain many publications that use Hubble-derived information less directly. You may now search this new database directly at http://archive.stsci.edu/hst/bibliography/. A description of the Collection Methodology and some basic publication statistics are also available. Check the next issue of the STScI Newsletter for a description of how this bibliographic database has been used for some analyses. The library sends a list of newly found papers using Hubble data twice a month. To receive this list, please email library@stsci.edu.